Hi everyone, happy Friday! I hope you've all had a good week. 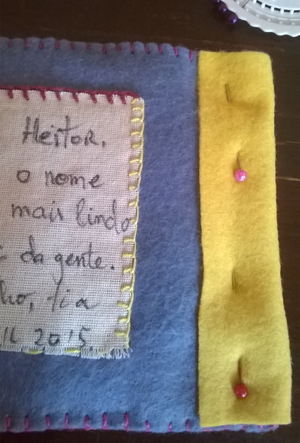 The quiet book I get to share with you today comes all the way from São Paulo, Brazil. 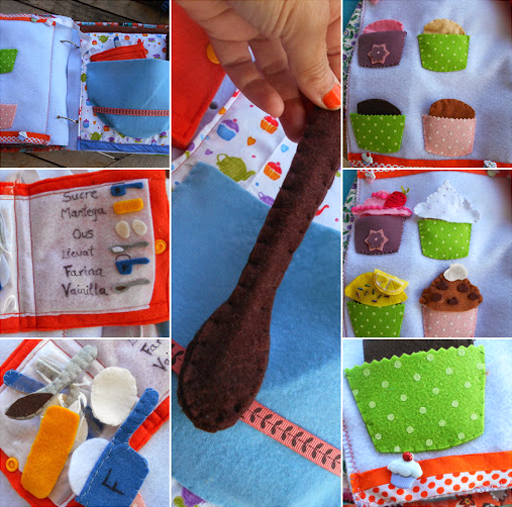 Made by Amanda for her friend's son, this book is seriously awesome and just bursting with fun activities. Amanda's has so many fun pages. 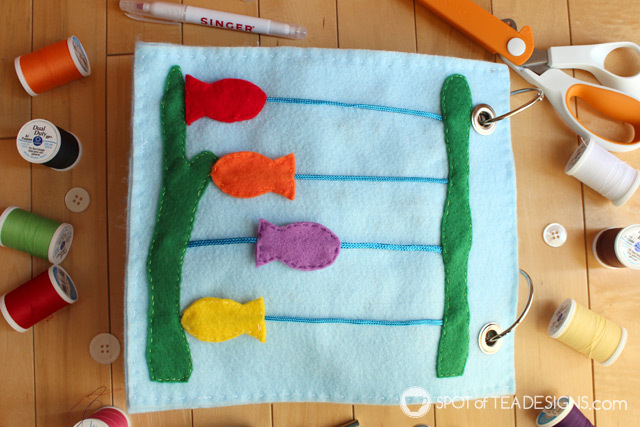 It starts right off with an interactive cover, where the child's name is spelled out in letters that can velcro on and off of the page, and be stored in a pocket on the front. After the cover is unclasped and opened, you see a clown holding several colorful balloons. These can are also attached with velcro, and they can be switched around to the different color strings, or stored in the clown's sleeve. Opposite the clown is Mike Wazowski from Pixar's "Monster's Inc." Mike's mouth can be unzipped to reveal shapes that match the shapes on his page. The next page has a car scene, with roads to drive on, a traffic light whose lights can be changed, and lots of different vehicles including a fire truck, ambulance, and cement mixing truck. The next page has a train with many different colored cars, each with a number to help practice counting. The next page spread is an outer space scene, with a rocket, astronaut, comets, planets, aliens, and spaceships.When you turn the page again, you find a boy at a table. His mouth can be unzipped and you can pull a lot of different kinds of food out (a carrot, egg, watermelon, cookie chicken, etc.) that can be put on the plate in front of him and then "eaten." Next is a dog with a collar to buckle, a bone, and a dog house. After the dog, the next page spread is a forest scene with all sorts of animals to play with and fun things to do. 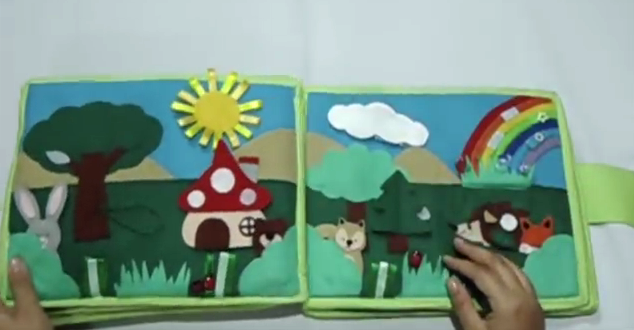 There's finger puppets of a rabbit, bear, squirrel, hedgehog, garden gnome, and fox, plus trees, a sun and raincloud that can move, a rainbow, a mushroom house, and more. I think this is my favorite page! Next come an apple trees that also has a bee you can string through loops to get back to his beehive, and a frog that catches flies with his tongue. Then there's a sports page with a soccer ball to weave and a shoe to lace up, and finally, there's a dress up page with a little boy and a wardrobe full of clothes for him to wear. Watch for yourself to see all the cool pages! Hello! My name is Amanda, from São Paulo, Brazil. I love to work with my hands; I'm a dentist and a seamstress aspirant. 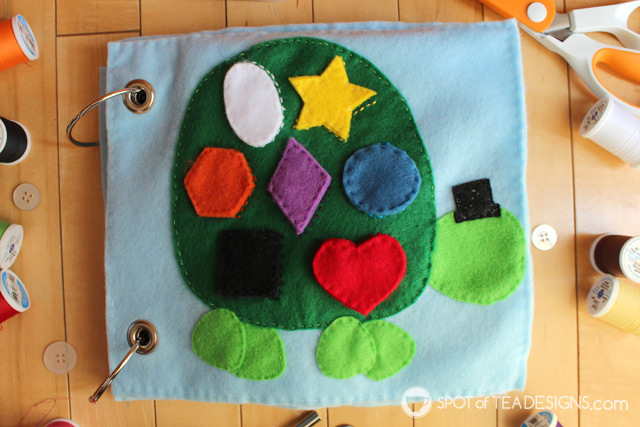 My friend asked me to make this quiet book for his son, Bernardo, who is 2 years old. I'm a beginner. I learn something every day!! I did this book on my vacation. I spent 15 days about 8 hours per day. The templates were designed by me and my husband, Samuel (he is art director and he helped me a lot! ), always inspired by many google images. 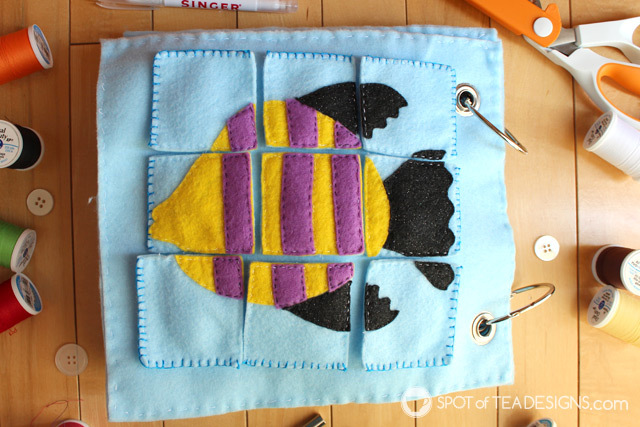 The pages are sewn to each other by a piece of fabric on sewing machine. 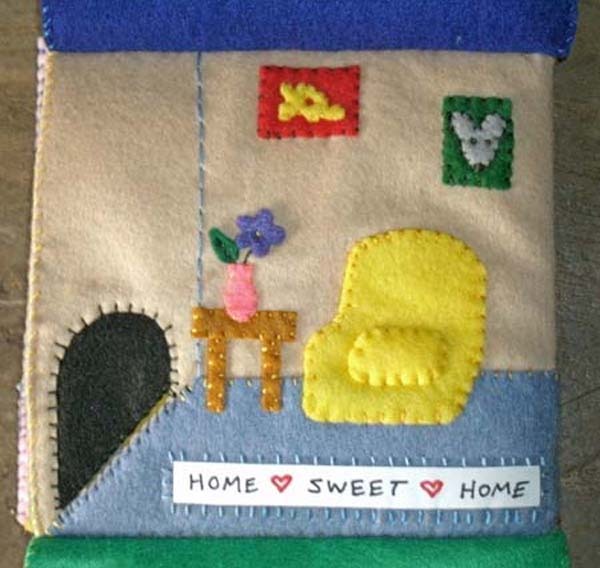 The cover was made in fabric and the inside pages of felt. For the "stuffing," acrylic blanket. 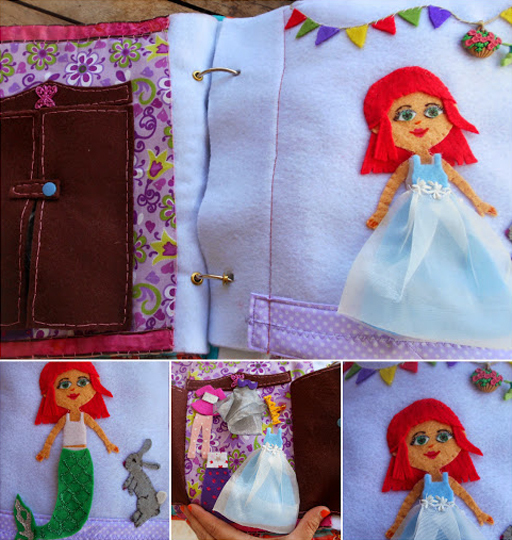 I also used thread, ribbon, rings, buttons, velcro, pearls and zipper. I probably spent about R$ 150 (US$ 50). 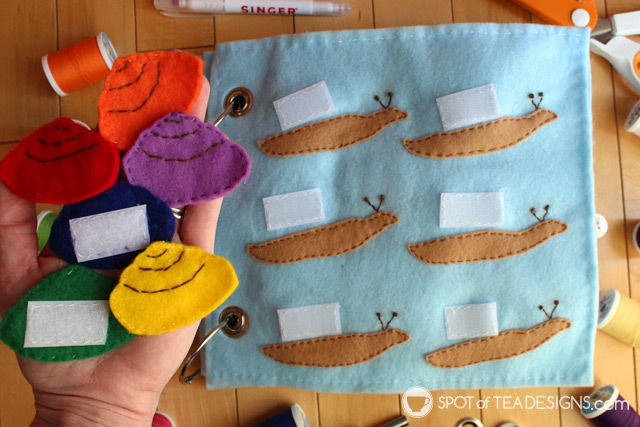 My favorite page is the Enchanted Forest and its finger puppets. Amanda, your book is amazing. Thank you for sharing it with us! Oh my gosh, you guys. Today's quiet book is so cute. So cute. I am constantly amazed at all of the talent you guys have, and this book that's been shared with me has brought that home again. You. guys. are. Amazing. 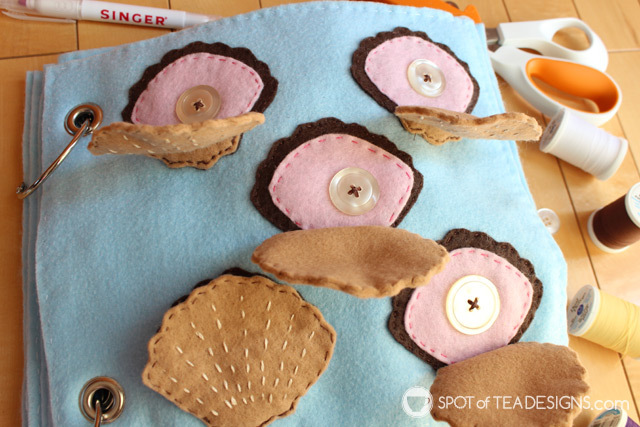 Tara from the blog Spot of Tea Designs made this "Under the Sea" quiet book, and it is fantastic. Each page is so colorful and cute. 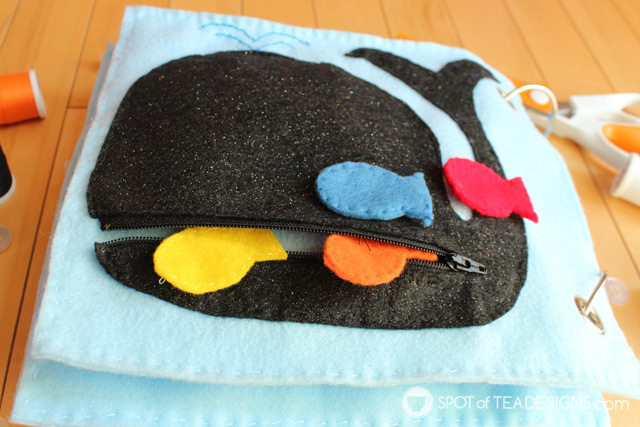 It has a colorful swimming fish page, a peekaboo clam page, an octopus with beaded arms to practice counting, a colorful snails page with velcro shells, a build-a-sandcastle page, a shell-shapes turtle page, a treasure chest page filled with sea animal finger puppets, a whale (with a zipper mouth) page, and a fish puzzle page. And do you know what's absolutely awesome? 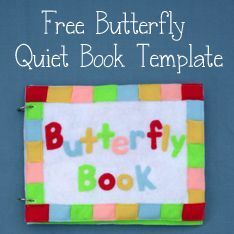 Tara made templates for every page in her book, and they are free to download and use if you visit her blog. Enjoy! Tara. 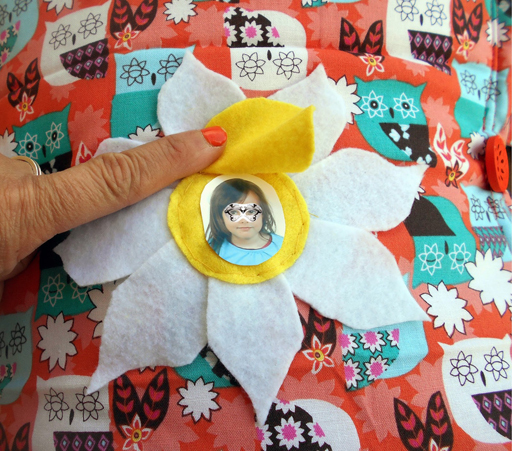 I was creative a long time before I was a mom and now I found a way to be both! My daughter, age 18 months. Beginner, self taught hand sewer. I have no idea, but longer than I expected! I completed this over several weeks whenever I could find time to work on it. Mostly at night or as a passenger in a long car ride. Yes! 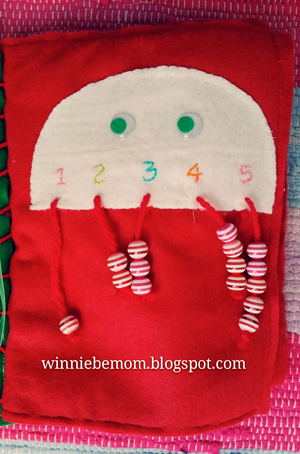 I made my own and they can be found as free downloads on my blog posts. 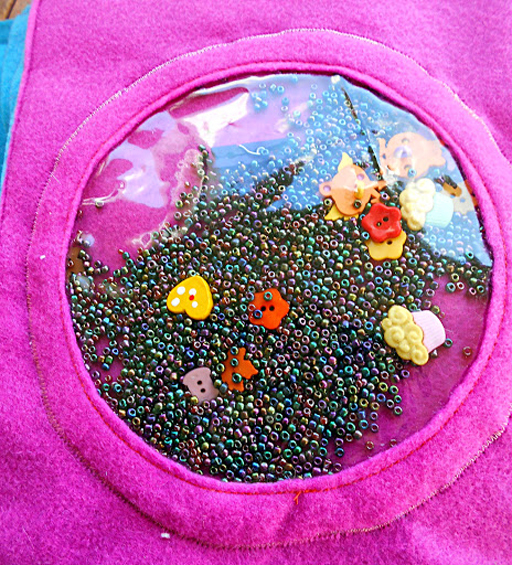 Buttons, beads, velcro and shoelace cords were used as accents. I spent maybe $15 on the whole thing as I used a lot of what was already in my collection. 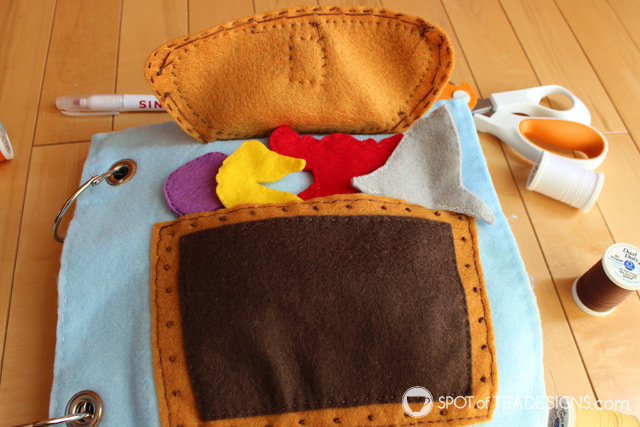 I like the treasure chest with the pocket for finger puppets. Tara, thank you so much for sharing your awesome quiet book with us! Now off to make my own, haha! 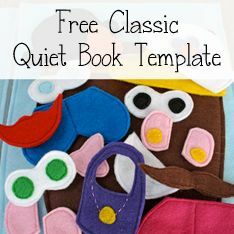 Kelsey, author of the blog Inspirational Living and a missionary wife and mother living in Cameroon, Africa, has been featured on the Quiet Book Blog before with her awesome quiet book that she made for her nephew. 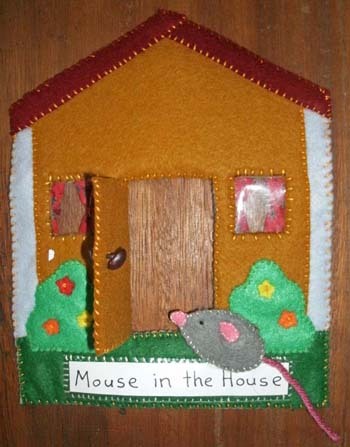 Today I get to share with you her "Mouse in the House" quiet book, one of the cutest quiet books I have ever seen. The front cover looks just like a house, and in fact has a door that opens up to the inside page. 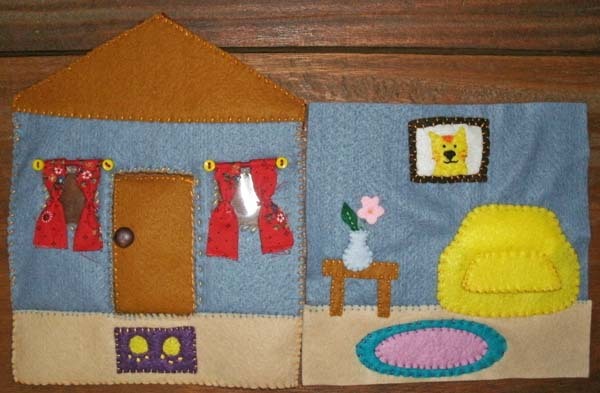 The pages that it opens up to are the front entrance and living room of the home, with little vinyl windows, curtains, an armchair, framed pictures, tables, flowers, rugs - the details are all so cute and awesome. The next page, though, is my favorite - the kitchen. It rocks. 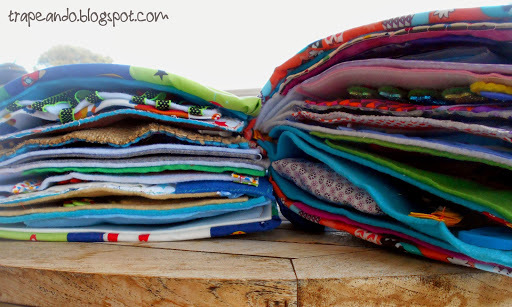 It makes me want to start sewing something like it right now. 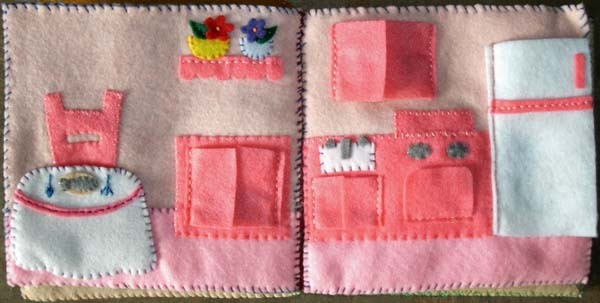 (Again, you should check out Kelsey's blog post of this quiet book - it has even more pictures of the kitchen!) 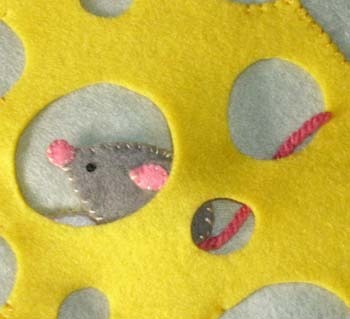 The last three pages are as cute and fun as the rest of the book, and have cheese, cats, and more secret passageways. My name is Kelsey Weber. I am a missionary wife and mother serving in Cameroon, Africa. 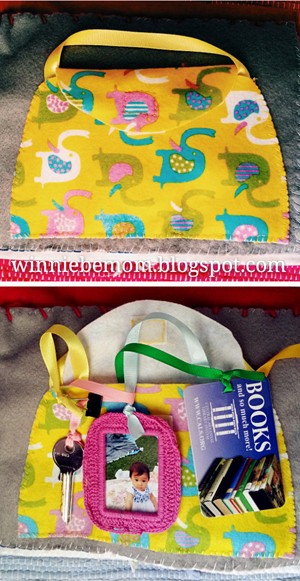 I made this quiet book for my 1-year-old daughter, Keturah. It took about 16 hours total to make this book. I worked on it for about 1-2 hours a day for 2 weeks. 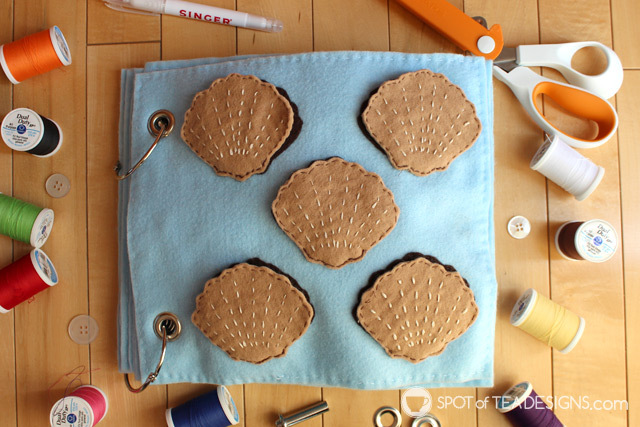 I did not have any templates for this project, but I did browse through Pinterest for some ideas and inspirations. 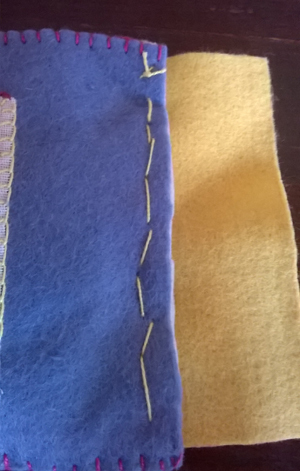 Since there aren't many pages to this book I just did a simple whip-stich along the edges of the pages and sewed them together that way. 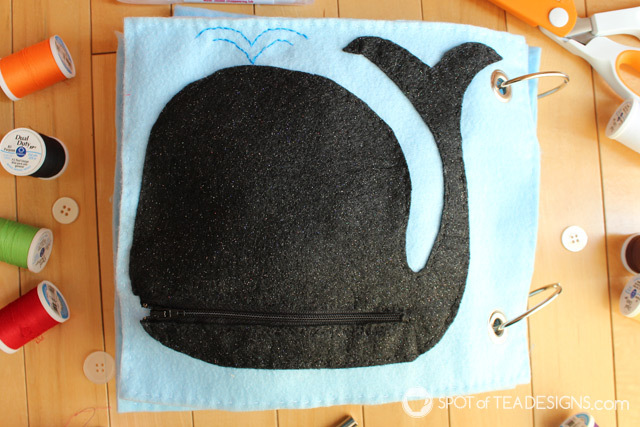 All the pages are made out of felt. Other materials incude cotton fabric for the window curtains, buttons for the doornob, thin sheets of clear plastic for the windows, and embroidery thread for all the sewing. I made this book with craft supplies I already had on hand, so I'm not sure exactly how much the materials cost, but I would guess about $10. 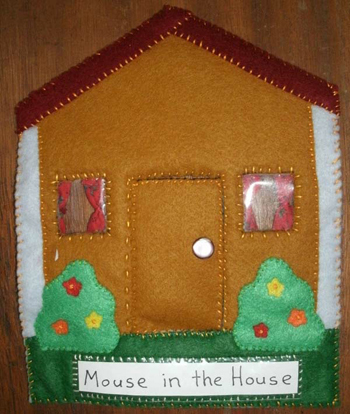 To view Kelsey's "Mouse in the House" quiet book on her own blog with more pictures and explanations, click here: Inspirational Living - Mouse in the House Quiet Book. 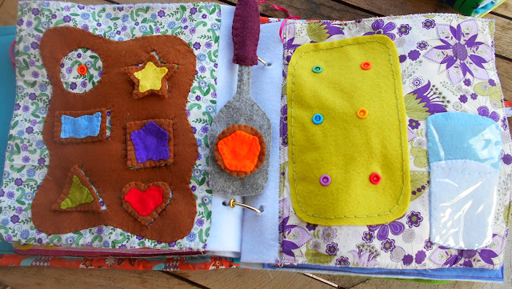 Kelsey, thank you so much for sharing your seriously adorable quiet book with us! 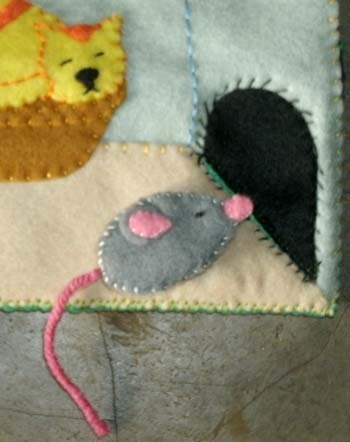 If you liked Kelsey's "Mouse in the House" quiet book, you'd probably also like Claudia's Teddy Bear House quiet book and Agata's Fox quiet book. Ola! 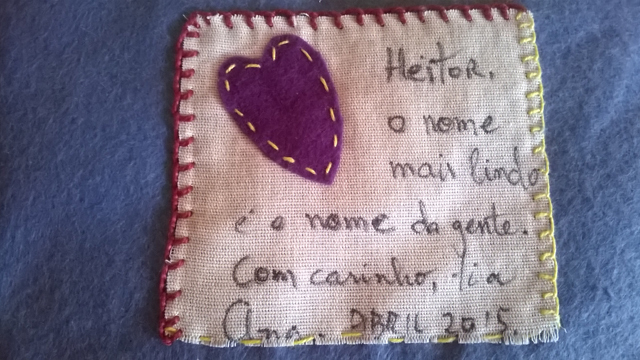 Today's quiet book comes to us from Brazil, made by Ana Maria. She made this adorable book for her friend's two-year-old, with letters on each page spelling out his name through the book. Each letter has an animal whose name (in Portuguese) matches the letter. "H" for hipopotamo, "E" for elefante, "I" for iguana, "T" for tatu, "O" for ovelha, and "R" for rato. She also wrote a personal message on the back cover for him, and included helpful pictures that show how she bound her pages together once she had made them. My name`s Ana Maria. 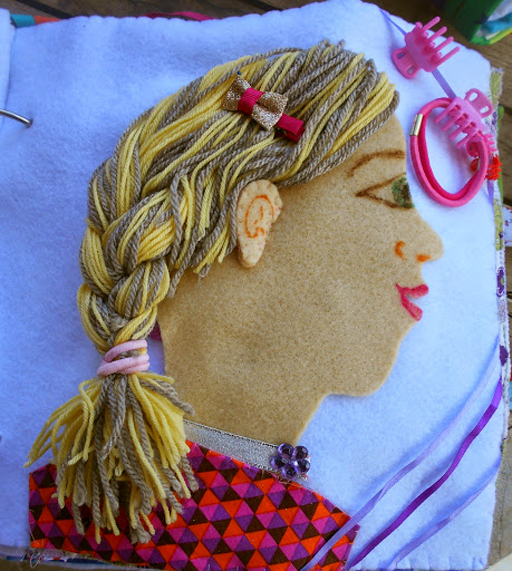 I have three teenager sons and I love new experiences about craft. 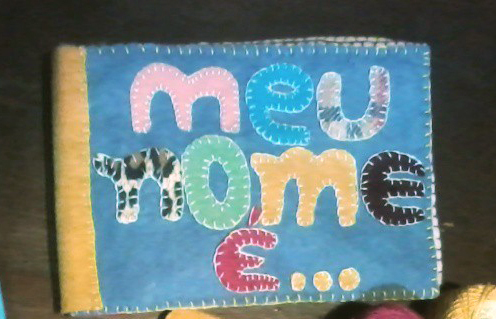 To Heitor, son of my job friend. He is two years old. Very low. 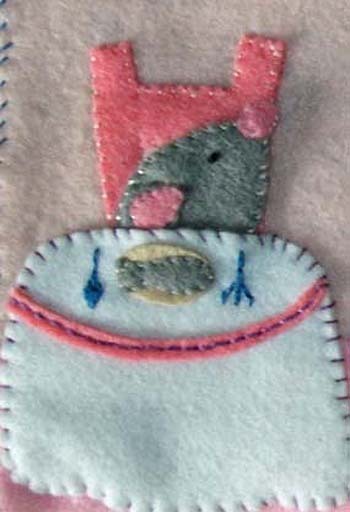 I used just felt and hand sewing. I created my own templates. I sewed and I used glue. 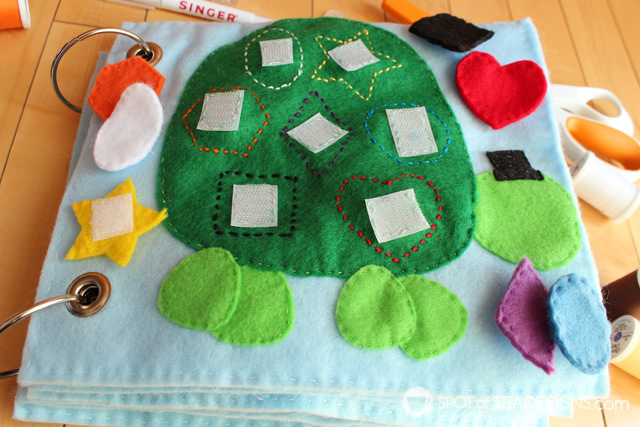 I want to use other materials in the next projects, such as wood, buttons, magnet, fabrics, plastic, photos and illustrations. I don't know, because I already had the materials. Ana Maria, thank you so much for sharing your quiet book with us! 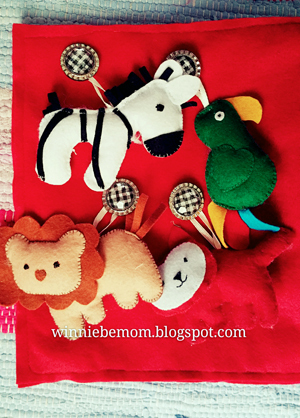 Today's adorable quiet book comes to us from Winnie of the blog Be A Creative Mom. 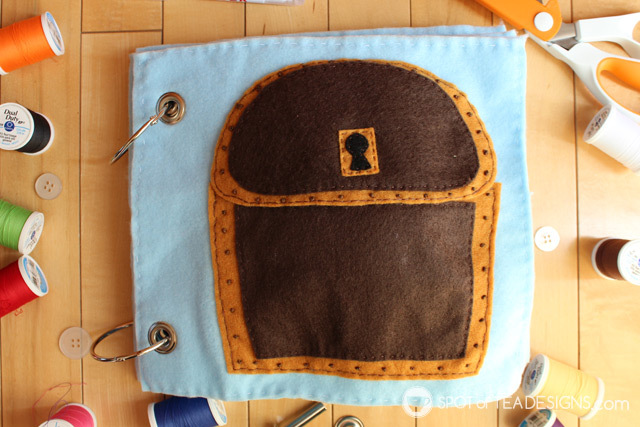 She hand-sewed the entire thing in just about a week, which is seriously impressive! 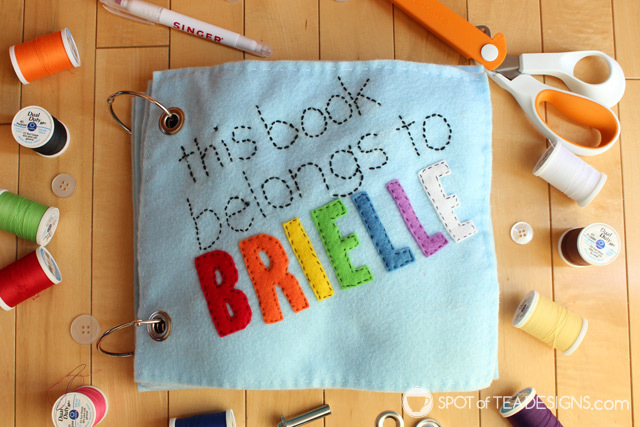 I love the look that hand-sewing gives quiet books, and I especially love the embroidery that Winnie added to the front and back covers. 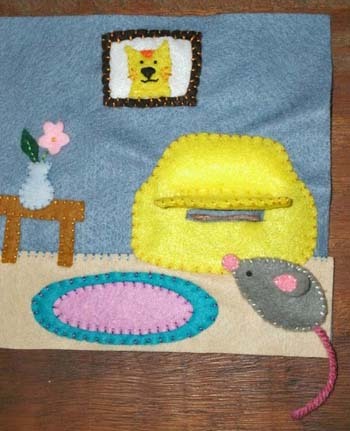 In addition to the awesome embroidered covers, Winnie's quiet book has a safari animals page (the animals are hanging on buttons, and can be removed and played with), a purse page (with toys to find inside), a shapes page, a numbers page (which flaps that lift up with objects underneath for children to count), a telephone page (with velcro numbers), a bee and flowers string page, a ribbon page, and an octopus page (with beads on his tentacles to count). My name is Winnie; I am a mom of 2 living in Singapore. I made this book for my one-year-old daughter. 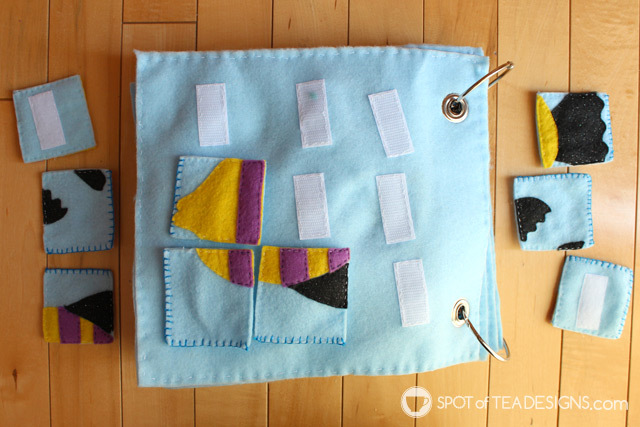 What's your level of sewing experience? How long did it take you? 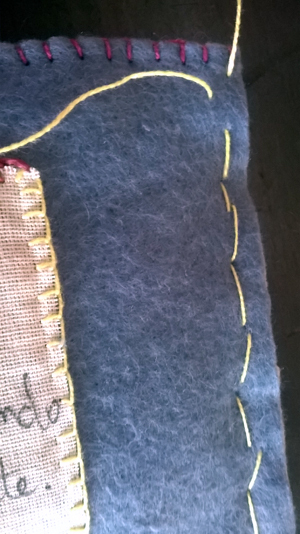 I consider myself a intermediate sewer, as I hand sew lots of stuff. My speed is actually decent. 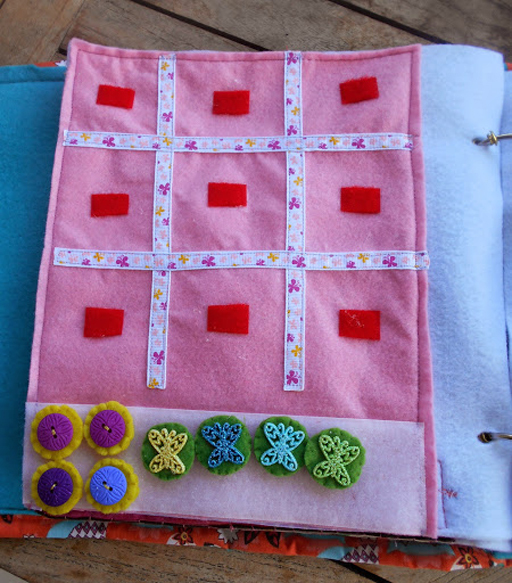 The book took me about one week to finish while sewing 2 hours a day. So roughly 14-15 hours. I used some from online. I don't remember all of the resources so just listed what I can find as below. Just want to say thank you to all the fantastic moms who posted their templates. 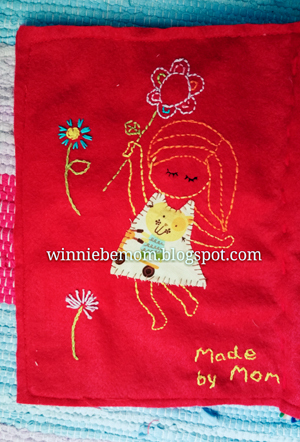 The purse page is from Apron Girls: Quiet Book. Ribbon page is from And Next Comes L: Ribbon Pulling Quiet Book Page. Forgot where the octopus and bee is from... But they are super famous quiet book pages! 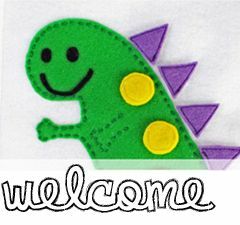 Beads, ribbons, yarn, velcro, a key, a card,etc. I simply love them all... I worked quite a bit to design and find pages suit my 1 yr old girl. 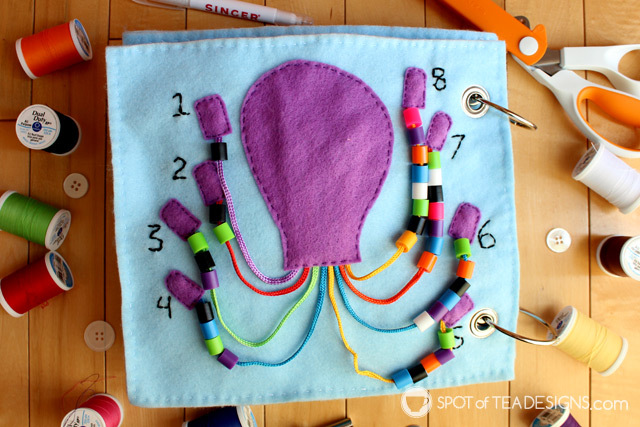 My girl loves the octopus beads page the most. 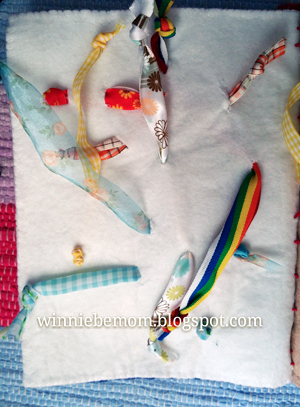 To see Winnie's quiet book on her own blog, click here: Be A Creative Mom - Quiet Book. Winnie, thank you so much for sharing your quiet book! 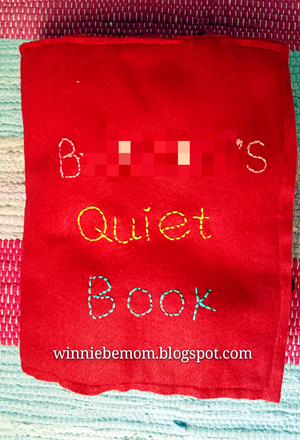 Today's quiet book comes to us from Linibau of the blog Trapeando. It is so cute and has some great and unique details. Starting right off, the cover has a flower that, when you lift up the center, you find a picture of the little girl the quiet book was made for. 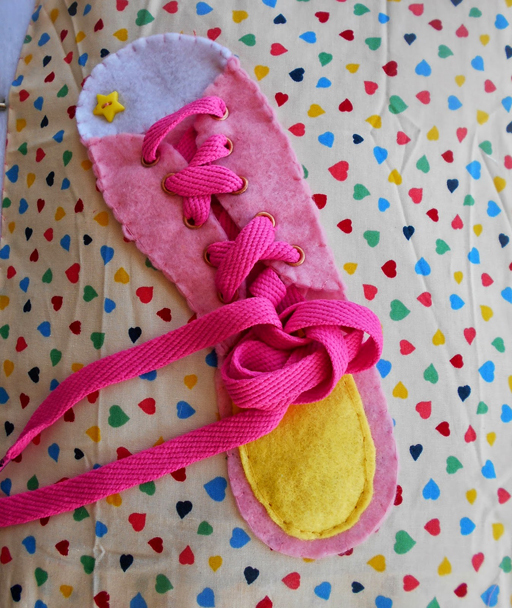 Linibau's book also has a really cute shoe-tying page, a princess dress-up page (with adorable doll, wardrobe, and clothes - I love the little triangle banner! 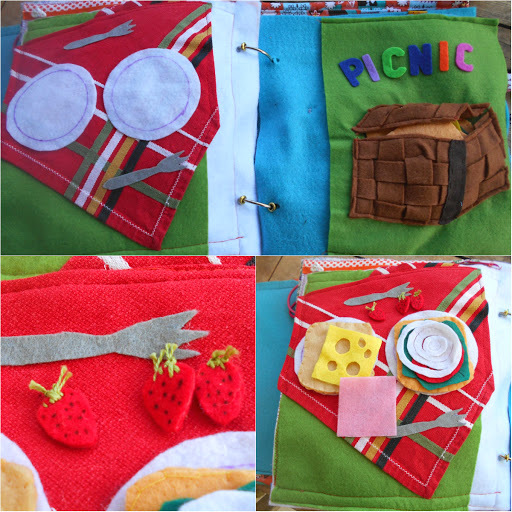 ), a tic-tac-toe page, a hair-braiding page, a cookies page that teaches color and shapes, a cupcake baking page, a picnic page (with a picnic basket full of food and a picnic blanket where you can assemble the meal), a counting page with strings of unique, awesome beads (cupcakes, crayons, strawberries, etc. ), and an I-Spy page. 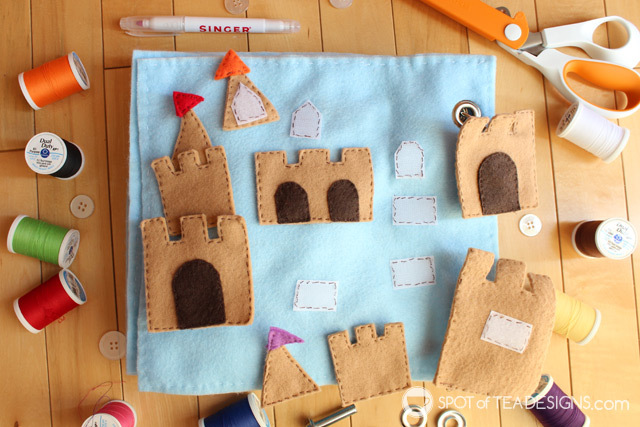 This book has so many activities and looks so fun. Enjoy! My name is Linibau from Trapeando. I'm a creative mum and teacher. 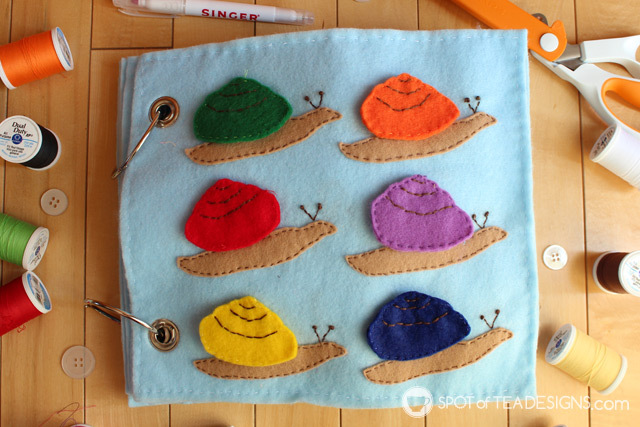 I made this quiet book for daughter. She's five years old. 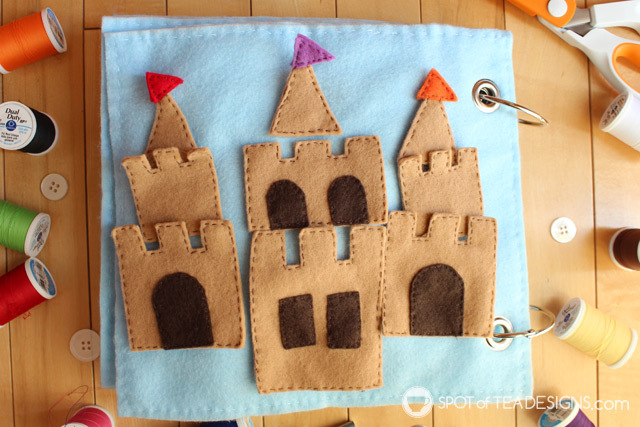 I have an intermediate level of sewing experience. It took me about 10 days (maybe 15-20 hours). I used two templates from Imagine Our Life. 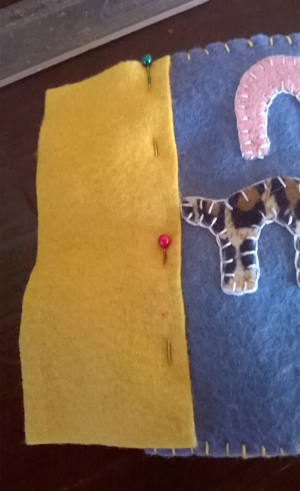 Felt or felt with fabric. Uf! The buttons are really expensive. About 50 €. The dress up and the hairdressing pages. 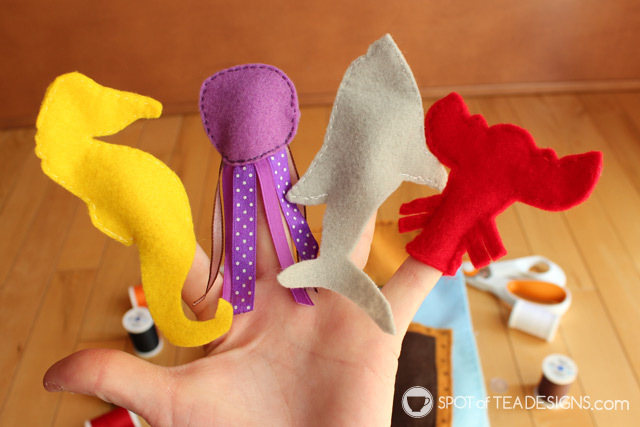 I enjoyed a lot designing them, thinking of my daughter's preferences and imaging her playing. 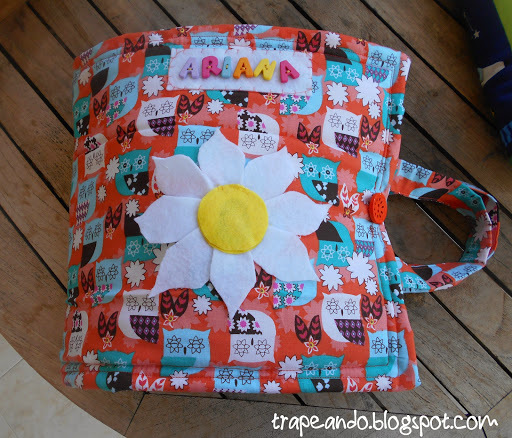 To view Linibau's quiet book on her own blog, click here: Trapeando - Quiet Book 1. 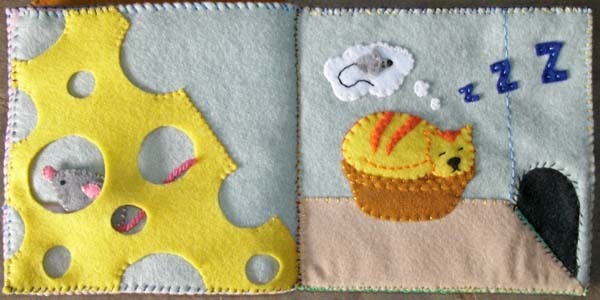 To see another adorable quiet book she made, click here: Trapeando - Quiet Book 2. Thank you so much, Linibau, for sharing your awesome quiet book with us!